In this landscape lights transformer review, we will look at the Hinkley 300 watt transformer. This is a very versatile item. We will look at the different parts and some add-ons to make this work for you. 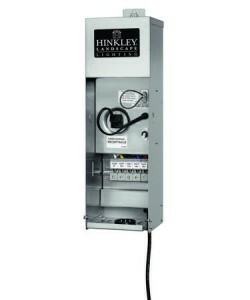 You get a Hinkley 300 watt transformer for your Low voltage landscape lights. It is 5.5 inches wide and 17 inches tall. The cabinet is made of Stainless Steel. A three foot power cord to hook to a 110 ground fault circuit is connected to the bottom of the case. The bottom of the case has a hole for the wires from your lights to enter. Five different wire hookups on the bottom range from 12 to 15 volt output. The different outputs are for different lengths of wire runs to keep all of your lights at the same brightness. Your Transformer will power 300 watts of total lights. Having a series of wire hookups will let you power the extra long runs with the 15 volt outlet and still have 12 or more volts to the last light of the run. Don't forget to look at my post on wire size when planning your lighting setup. As this transformer does not come with any other type of switch other than the off and on, you will have to use one of the accessories below. When checking out you will be given the accessories that will fit the transformer that you have purchased. Several timers are available. The ones that cost the least will just interrupt the current at the plug at the source of the 110 current. They plug into the 110 current and the transformer plugs into the timer. You can choose between the electronic or the old fashion pin type to set the time to come on or go off. 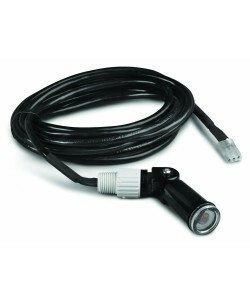 The Hinkley 1510 photo cell is a direct wire in with a 10 foot water resistant lead to have the photo cell mounted remotely. It will power your lights on at sunset and turn them off in the morning at dawn. There is a jumper wire in the transformer that will need to be removed for installation. The Hinkley 1503 ph photo cell is a direct wire in that will be mounted on the transformer. It also works off of direct lighting to control the lights on and off. Multiple taps to control the voltage drop for extra long wire runs. Can hook up photo cell (have to purchase separately) right on box or use the one with a 10 foot power cord. 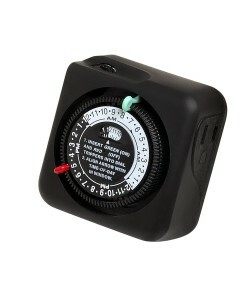 Have to purchase a Photo cell or timer to control when the lights are on. Large size case makes it hard to hide in landscape. If you are lighting close to 300 watts of lights on several different lengths of runs, the Hinkley 300 watt transformer will be the transformer that will meet your needs. Glad the information here was of some help in your project. Glad you found the information of the transformer a solution for your lighting. Glad I could be part of your low voltage lighting solutions. Great review John! The Hinkly 300 watt looks like a great option for anyone who wants to have a versatile and efficient landscape lights transformer. Despite the large size , I think it would be a good purchase. The feature I like the most is the possibility it offers to attach a photo cell. Way to go! Look for other review in the future. I will be looking at some of the all in one transformers with photocell already attached.